The Right Reverend André Soares (Angola), the Right Reverend Cleophas Lunga (Matabeleland), the Right Reverend Luke Pato (Namibia), and the Right Reverend David Njovu (Lusaka) shared progress that their dioceses are making towards malaria elimination in partnership with the Ministries of Health and 1,700 volunteer community activists. There has been significant advancement towards malaria elimination over the past 15 years: the number of malaria deaths has been cut nearly in half since 2004 (from more than 790,000 in 2004 to about 435,000 in 2017), and 37 countries that previously had malaria are now malaria-free. However, 3 billion people live in places that are still at risk of malaria. The church is active in these malaria endemic areas and is playing a crucial role in working towards elimination. Faith leaders joined together at the Round Table in their belief that eliminating malaria in Southern Africa is a real possibility, but not without participation of the most vital members of the fight against malaria – community members themselves. 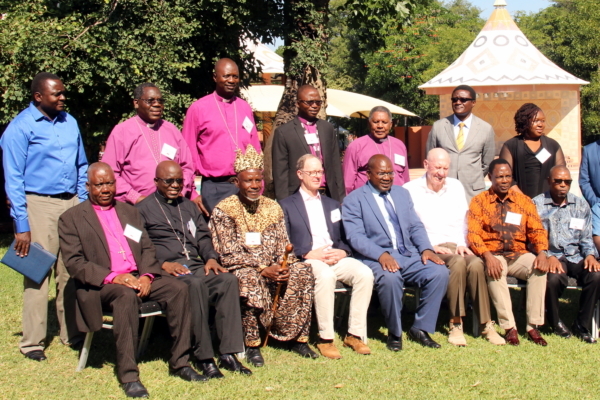 Throughout the Round Table meeting, Anglican clergy emphasized the importance of interfaith partnership to reduce deaths and suffering caused by malaria. Chama and Kaiso explained that the church plays a role in deploying its extensive infrastructure and networks to help disseminate accurate information and teach life-saving skills on how to prevent and deal with malaria—including in places that are beyond the reach of most NGO and even government services, but which have an Anglican congregation. He reminded us that God has given us all different abilities so that we can put ourselves together and create a solution. Jesus prayed that we may be one, and we can respond by working together and engaging our communities on the path towards malaria elimination. The Mother’s Union from St Andrew’s Parish in Livingstone, Zambia closed the gathering by singing songs they had composed about malaria prevention.